It’s a new year. Why not start it off with a new “U”? The retail version of Wii Fit U  for Wii U  hits stores today, just in time to help people get started on their New Year’s resolutions to be more active and get fit. But Wii Fit U doesn’t require heavy equipment or expensive gym memberships. With Wii Fit U, users can get active by navigating a luge course, spraying a water hose, bouncing on a giant trampoline and even grabbing the new Fit Meter to continue their workouts on the go. Fitness doesn’t get any more fun than this. Wii Fit U allows users to discover fun new ways to get up and get moving using their Wii U console and Wii Balance Board accessory. The game features some of the best activities from the original Wii Fit and Wii Fit Plus games, as well as new activities that incorporate the Wii U GamePad controller. Wii Fit U bundles also come packaged with a new activity meter called the Fit Meter, which is designed to sync up with the game and track daily routines. People can carry the Fit Meter with them anywhere they go, and then easily sync it to their Wii Fit U profiles to track daily activities like steps taken and calories burned. 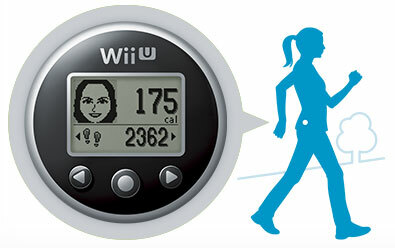 If the user doesn’t reach the calorie target, the game will propose a variety of Wii Fit U exercises to help bridge the gap. All members of the family can even own their own Fit Meter, allowing them to create their own profiles and compare their fitness progress and activities with each other. The Fit Meter can be purchased separately at a suggested retail price of $19.99. Wii Fit U is the most customizable and shareable game in the series. Users can create their own personalized workouts or select from multiple recommended workouts based on their fitness goals. These workouts can even be tracked using Miiverse (broadband Internet access is required). Members of these Miiverse gym communities can view their favourite workouts, as well as track popular activities and total community calories burned. Wii Fit U requires the use of the Wii Balance Board accessory. A bundle that includes the Wii Fit U game, a Wii Balance Board accessory and the Fit Meter accessory will be available in stores at a suggested retail price of $89.99. For those who already own a Wii Balance Board, an additional bundle with the Wii Fit U game and Fit Meter will be available in stores at a suggested retail price of $49.99. In addition, a one-month free trial of the full game experience can also be downloaded in the Nintendo eShop until January 31. Users that download this free trial can keep the full game permanently by purchasing and syncing a Fit Meter. 1 Comment To "Ring In A Healthy And Active New Year With Wii Fit U"